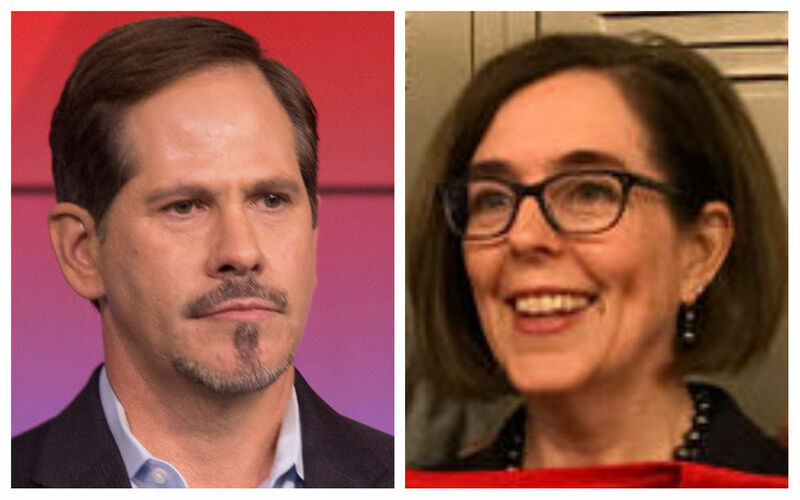 Perhaps few issues more starkly delineate the views of Kate Brown and Knute Buehler in this fall’s gubernatorial election than Oregon’s public pension system. Though the Public Employees Retirement System has been a hot-button issue in the state for decades, the political pressure may never have been higher. Schools, municipalities and government agencies are panicking as their required PERS contributions spiral to historic highs to help dig the system out of its $22 billion unfunded liability. There is no rescue in sight, and contribution rates are slated to jump again in July, pulling another $550 million a year out of public budgets statewide. Buehler, a Republican legislator from Bend, has made the pension system a signature issue of his campaign, citing it as a shining example of how the Democratic incumbent has “failed to lead.” He is touting a very specific list of cost-cutting measures he’d like to see enacted and has pledged not sign any spending bills until substantive PERS reform legislation lands on his desk. He’s not shy about addressing the pension changes that could reduce public employees’ compensation. “There’s unfairness in a lot of places. Having one of the worst K-12 school systems in the nation is not fair, one of the shortest school years, high student-teacher ratios, not enough wraparound resources, not enough counseling service. Teachers have to deal with all that, too. 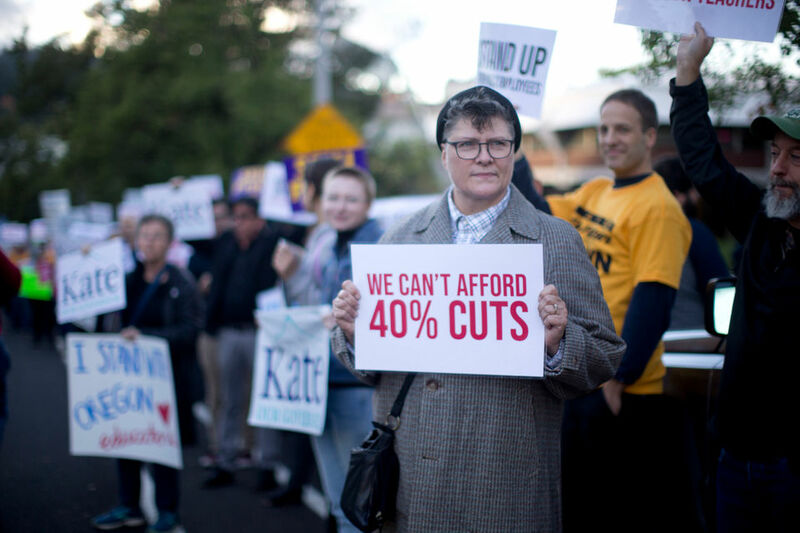 It’s not fair to loyal taxpayers who are paying taxes and not getting essential services they deserve. 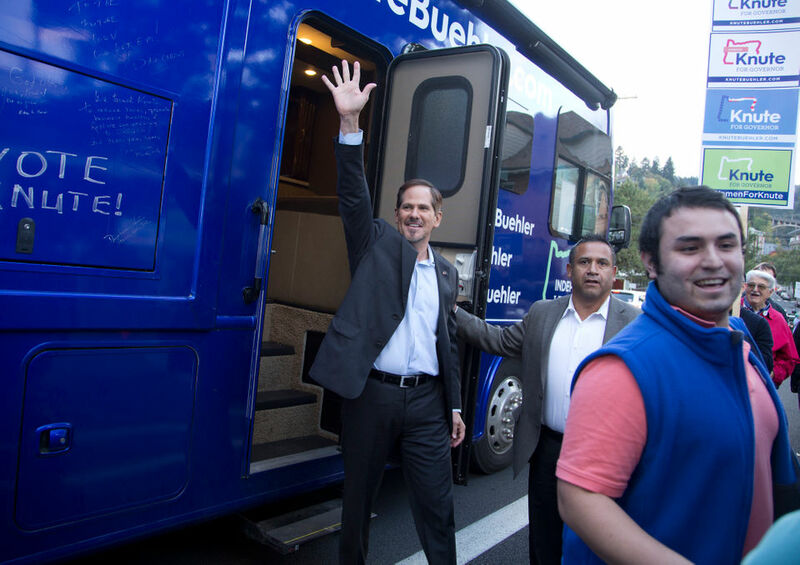 Few issues more starkly differentiate Rep. Knute Buehler and Gov. Kate Brown than how to pay down the Oregon Public Employee Retirement System’s $22 billion deficit. Brown adamantly rejects this characterization. She says her administration has enacted legally defensible measures that incentivize public employers to pay down their liabilities faster, and bolstered staff at the Treasury Department’s investment management division to save money and increase investment returns. Brown says Buehler’s “threats and bluster won’t get us anywhere,” and that she will concentrate on “actual solutions that solve the problem, solutions that you can actually deliver upon. Buehler’s list of reforms hues closely to those promoted by Oregon’s business community, and there are question about his agenda’s odds in a Legislature dominated by Democrats. Brown’s pension talking points, meanwhile, align closely with the stance of public employee unions: The state can’t solve its pension problems on the backs of workers, cutting their benefits while expecting to attract a competent workforce. There is a limited menu of changes to the pension system considered economically meaningful and legally viable in light of past decisions by the Oregonian Supreme Court. None would erase the pension deficit, though it is possible to make cost reductions that would help employers. What follows is a discussion of the fixes being discussed and the candidates’ respective positions. Oregon has the only public, defined-benefit pension plan in the country that requires no employee contributions. The average contribution in states where employees also receive Social Security benefits, like Oregon, is 6 percent. Public employees here are required to kick 6 percent of their salary into their retirement, but since 2003, that money has been directed into a supplemental defined contribution plan similar to a 401(k) that belongs to the employee and comes on top of pension benefits. Until recently, about 70 percent of employees had this contribution paid by their employers, a concession negotiated in lieu of wage increases nearly four decades ago; it has since become a standard part of collective bargaining agreements. Buehler wants to see employees’ 6 percent redirected back into the pension fund. If applied to all public employees, that could offset about $600 million in employer contributions to the pension fund every year, reducing the drag those expenses place on schools, public safety, cities and state agencies. This not something the Legislature can accomplish by fiat, however. If it did pass such a bill, employees would demand wage concessions in bargaining. Brown says she’s not opposed to some level of employee cost-sharing. She says she supported Senate Bill 1068, a cost-sharing proposal that Senate President Peter Courtney, D-Salem, dangled at the end of the 2017 legislative session, then deep-sixed because lawmakers wouldn’t agree to significant new taxes in return. Many public employees believe Rep. Knute Buehler’s proposed PERS reforms will eventually reduce members’ retirement by as much as 40 percent. That bill would have had employees contribute 1 percent of their salary to the pension fund, gradually increasing to 2 percent. Critics said it was too small to make much difference. Brown calls it “a starting point” while also making clear she has no interest in moving the entire 6 percent back into the pension fund. This proposal is anathema to unions, who rightly say it would be significant reduction in employees’ total compensation. It would cut or eliminate employee benefits from the defined contribution portion of the retirement plan, which the Service Employees International Union Local 503 says will eventually reduce members’ retirement by as much as 40 percent. That depends on how you calculate it. In terms of nominal dollars going to the employee, the number is closer to 20 percent. Either way, it’s a big number. Meanwhile, Brown says she’s already moved to give 98 percent of state employees more skin in the game. Recent union contracts have state employees paying their own 6 percent contribution to the retirement system, in place of the employer pickup. From an expense standpoint, however, it doesn’t help, as Brown gave state employees a 6.95 percent raise in exchange. That pay increase, compounded over employees’ careers, will give them higher wages, higher overtime, higher differential payments, higher social security benefits, higher final salaries and finally, higher pensions. This was in fact a significant concession to employees, and one that could make pension cost-sharing politically harder to achieve, as any redirection would now be coming out of employees’ paychecks. Rep. Knute Buehler’s proposed PERS reforms align with those of the business community. Whether they can advance in the legislature is another matter. This one gets confused quite a bit. Proposals have been floated in the past to put an absolute cap on pension benefits at $100,000, which would eliminate the system’s largest pension payouts. That’s legally dubious. And Buehler says it’s not what he’s suggesting. His proposal – and one that has seen quite a bit of airtime before – is to cap the final salary that PERS uses to calculate employee pension benefits at $100,000, indexed for inflation. In fact, that would be a more consequential change, affecting substantially more employees. Legally, it could only apply prospectively, on future service by employees. But in the long run, it would limit maximum pension benefits for career employees to $45,000 to $50,000 a year, though that figure would grow with inflation. Brown is not a fan. She says the 2003 Legislature already created the Tier 3 level of benefits and capped pensionable salary at the federal level. Actually, that’s an IRS rule, and the current $275,000 limit, indexed for inflation, applies to all employees hired after 1996. Under Oregon PERS formulas, which provide 30-year employees 45 to 50 percent of their final salary, the federal limit can still produce very hefty pensions. From a practical standpoint, however, it doesn’t have that much effect because few employees are paid that much. Brown reiterates that she’s not interested in cutting public workers’ retirements. This is another Buehler favorite. Details are scarce, though, regarding how much the state would contribute or match, and how much would that save employers, if anything. For general service state employees, the cost of the current pension system for one year of service, excluding any charges to pay off the deficit, is about 8 percent of salary for Tier 3 employees, and 16 percent for Tier 1 and Tier 2. A 401(k) could certainly be cheaper, but employers would still be stuck paying down their existing pension liabilities, and employees would still be entitled to benefits they’ve already earned. They won’t just go away. Buehler offers few specifics but suggests the easiest first step would be for the state to establish a 401(k) for new employees, effectively creating a Tier 4. Brown says it’s offensive for a millionaire like Buehler to compare his retirement options with those of middle-class state workers. Nor is she convinced such a move would save money. The state would still be stuck paying off its old liabilities, and as members still owed a pension aged and neared retirement, PERS would have to gradually adopt a more conservative allocation for its dwindling pension investments, some studies show. And that would reduce returns and require higher contributions from employers. Brown says a 401(k) is not inherently unfair. But she says it needs to be examined as part of an entire compensation package, not as an isolated change. The state is currently putting together a new salary survey that will examine employees’ total compensations versus other private and public sector workers. “You need to consider the full package, and if I’m going to hire the best and brightest, I need to be competitive with the private market,” she said. Gov. 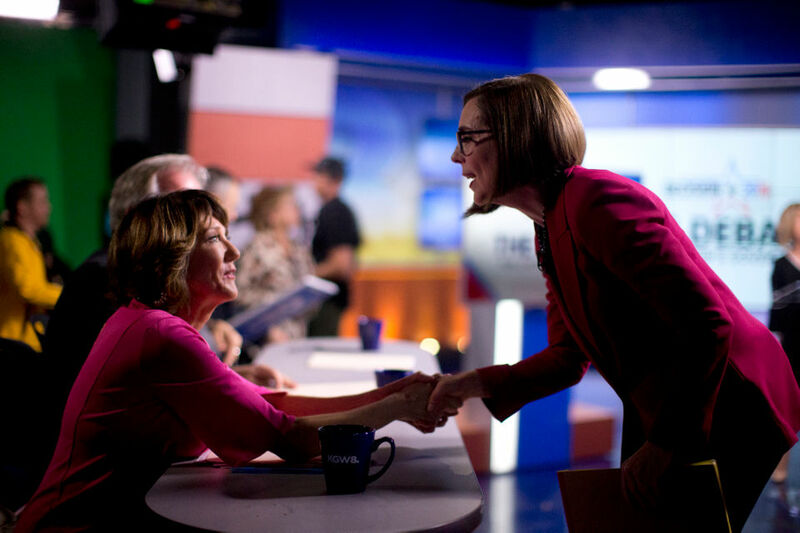 Kate Brown (right), greeting KGW anchor Laural Porter, counts legislation that established funds to incentivize employers to pay down PERS liabilities among her achievements. One of the things Brown touts in her leadership on PERS was the task force she set up in 2017 to come up with ideas to cut the pension system’s unfunded liability by $5 billion. Essentially, she convened a group of certified smart people over a period of months to brainstorm ideas. The task force did suggest a dozen things that could generate savings, but most were dismissed as political non-starters. The most significant outcome was Senate Bill 1566, which will redirect a portion of state revenue to establish two new funds. The first is a pooled side account at PERS for school districts that would be invested alongside existing pension assets and drawn down to reduce individual school districts’ pension contributions. The second fund aims to incentivize all public employers to tap their own reserves and make extra one-time contributions to the pension fund. The state would match those extra contributions by 25 cents on the dollar. Comcast settled a decade-long property tax dispute in June, agreeing to pay $155 million to local governments. Brown urged the governments to use the windfall to help pay down their pension obligations, and the mayors of Portland, Beaverton and Eugene all said they would support that request. The school side account and incentive funds have yet to be funded, and one issue is that not a lot of public employers have extra money sitting around to plunk into PERS, whether there’s an incentive available or not. The incentive money will not be granted on borrowed funds. Brown says she has also pushed to give the Treasury more staff to bring additional investment management in-house, versus outsourcing the services to Wall Street banks and paying higher fees. Wheeler, when he was state treasurer, tried to usher the so-called Investment Modernization Act though the Legislature repeatedly, but was rebuffed by Courtney. “We took component parts of that bill, including increasing staff at the Department of Treasury, and we got that done,” Brown said. Very little legislation tied to the Public Employees Retirement System has made it out of committee and to a vote since Rep. Knute Buehler joined the legislature in 2015. He voted against Senate Bill 1566 last year, which established incentive funds to push employers to pay down liabilities. Gov. Kate Brown signed the measure in April and claims it as her signature achievement in the PERS realm. Buehler’s reform agenda is largely drawn from Republican pension reform measures that Democrats never allowed out of committee.